Clarecare is the largest Clare based, not for profit agency providing a unique range of support services for people in County Clare. Clarecare, originally Clare Social Service Council, was set up in 1968 as a means of co-ordinating and developing local services for the elderly. The Clare Social Services Council (CSSC) met with an enthusiastic response from the voluntary sector. It began as a parish based organisation with twenty three a liated organisations, the first staff member was employed in 1969, with the first Director starting in 1973. The initial focus was the provision of services for older persons, but by the end of the 1970s, CSSC had extended into services for children and families as more needs were identifed. 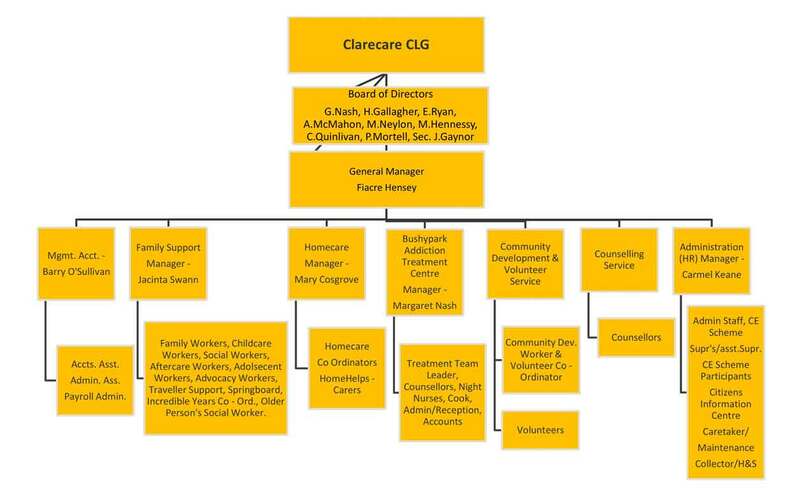 Clare Social Services Council was renamed Clarecare in 1987. Clarecare became a company limited by guarantee in 2003. The registered office is Clarecare, Harmony Row, Ennis. Registered in Ireland no. 350248. Charity no. CHY 6677. Registered Charity Number (RCN): 20012847. The Board’s role is corporate governance of Clarecare. Board members: Rev. Ger Nash (Chairperson); Hugh Gallagher (Treasurer); Eugene Ryan; Helen O’Sullivan; Michael Neylon, Margaret Hennessy, Colette Quinlivan, Phil Mortell, Jean Gaynor (Sec). Fiacre Hensey is the General Manager and reports to the Board.